79 For a Fellon Take [rew?] and soape and boares greace and stamp them together and lay it to the fellon. 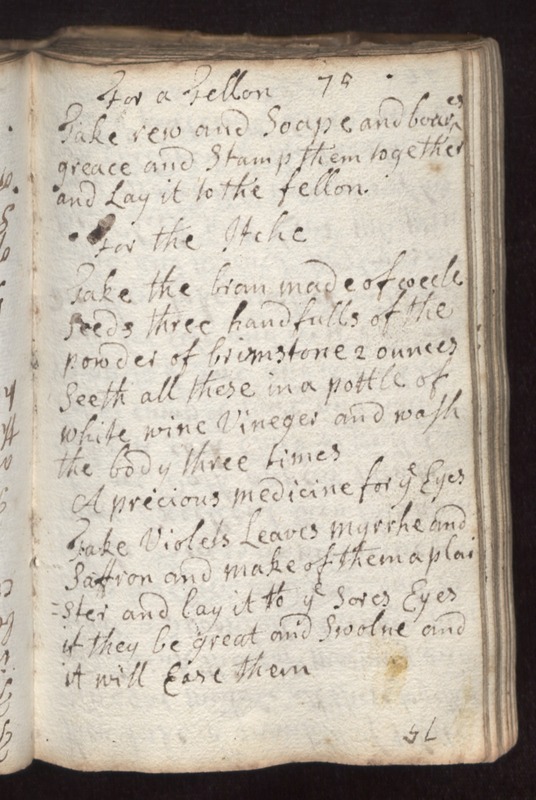 For the Itche Take the bran made of [coecle?] seeds three handfulls of the powder of brimstone 2 ounces seeth all these in a bottle of white wine vineger and wash the body three times. A precious medicine for ye eyes. Take violets leaves myrrhe and saffron and make of them a plaistre and lay it to ye sore eyes if they be great and swolne and it will ease them.